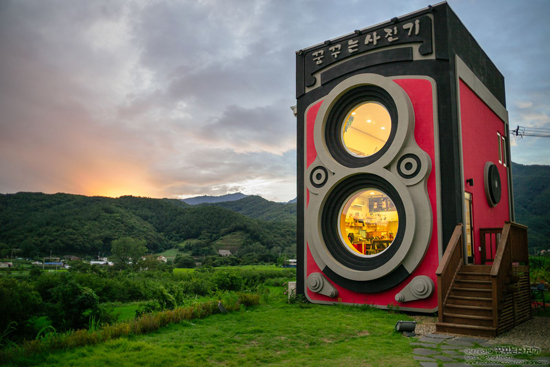 Inspired by a love of vintage cameras, a South Korean couple have designed and built an extraordinary cafe to replicate a classic twin-lens Rolleiflex, right next to their home. Army aviation pilot Park Sung-Hwan and his wife Kwak Myung-hee, an ex-pilot herself, decided to build the cafe for their family (including their daughter) and local customers to enjoy. Dreaming of capturing life's special moments, living closer to nature and owning a dog, the family trio could achieve these goals with the Dreamy Camera Cafe, hence its name. As you can see, the cafe looks just as impressive all year round. What do we love about it? Not your average cafe, this space is preferred as a place for dreamers, where you can talk about your ideas, have an instant photo taken and record your memories for all to enjoy - rather than a quick coffee and photo to tick off your bucket list. 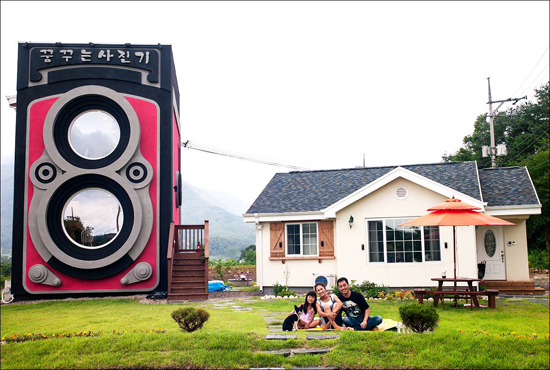 Comprising of two stories (30 feet tall in total) to mimic the classic twin-lens camera, the cafe provides a stunning view of the countryside. The interior features Park's vintage camera collection on display, while the tables include coloured pencils, a menu inside a photo album and a film roll-style paper towel dispenser. The original design was based on the Leica rangefinder, another vintage camera, however this proved too challenging from a technical perspective. After sketching a design in 2009, the couple presented the concept to contractors before building began in 2012, with the cafe opening in 2013. The family of dreamers: Park Sung-Hwan, his wife Kwak Myung-hee and their young daughter with her new dog.